AutoFEM Analysis Lite x64 provides a free solution of finite element analysis for Autodesk® AutoCAD® 2010, 2012, 2013, 2014, 2015, 2016, 2017, 2018, 2019. The system is fully integrated into AutoCAD 3D environment. 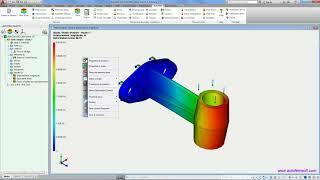 This means that all process of finite element (FE) analysis is going directly in AutoCAD interface. All results of calculations are saved in AutoCAD .DWG file and can be used for analyzing and presentation to a customer. Support of AutoCAD 2019 is included.